Newborn babies are experiencing everything for the first time, including their first touch from mom and dad. This early contact helps promote healthy psychological and physical development. Lack of physical contact can prevent normal development and can even lead to higher rates of illness or death in infants. Your touch can be especially important for your premature infant or infant born at a low birth weight. Healthy, effective contact with your baby includes cuddling, gentle massage, stroking and holding your newborn. Human contact is an important aspect of caring for your newborn. The health of a your new baby is highly dependent on receiving touch stimulation from other people. Infants who are touched gently on a regular basis gain weight and grow at better rates than babies who lack this contact. They also spend less time in the hospital after birth and have fewer medical complications in their first year of life. The first contact a newborn has with you, his mother, sets off cascades of hormones in his body that benefit his health and help him regulate his body temperature. Your touch can lower the levels of the stress hormone cortisol in his body, leading to better sleep patterns in infancy and a tendency to be less fearful or inhibited later in life. Also, the bonding hormone oxytocin rises during physical contact between your newborn and his parents, increasing the feelings of attachment between members of the new family. Being held close to you helps your new baby to regulate his body temperature, allowing him to conserve energy. Skin-to-skin contact immediately after birth and in the first few days of life is one kind of human touch that can particularly benefit your baby. 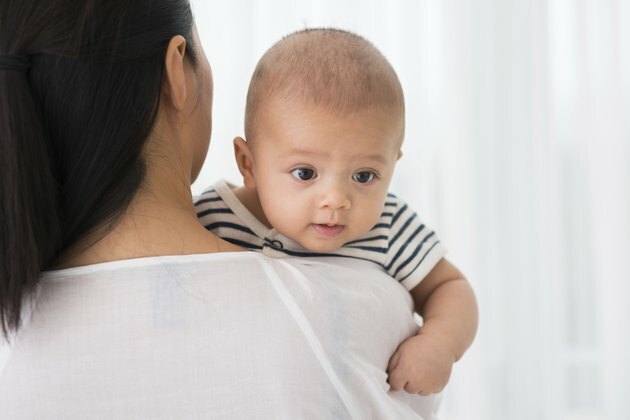 Sometimes called "kangaroo care" or "kangaroo mother care," this skin-to-skin contact can help improve your baby's breastfeeding ability and growth rates. Premature babies especially need skin-to-skin human touch to help them survive and thrive, and kangaroo-care advocates point out that a preemie baby's temperature is regulated better when the baby is given skin-to-skin contact with the mother than when placed in an incubator, leading to better survival rates for these infants. Human contact for newborn babies should not be limited to you, the mother, but should also include your partner as well. Although babies often receive a lot of physical contact with their mothers, fathers are less likely to share physical contact with their new babies, especially if the mother is breastfeeding. However, contact between your partner and your new baby promotes family bonding and makes the baby feel more secure and relaxed. 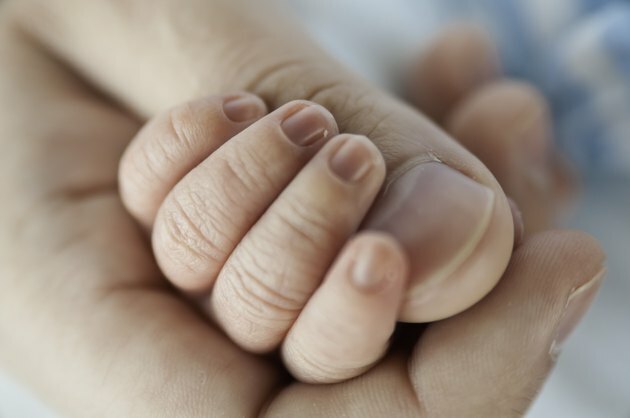 Touch between you, your partner and your newborn can facilitate the bonding process from the first moments after birth. Healthy bonding with both parents can also help your infant develop better psychologically and socially later in life. Babies who don't receive human contact in their first days or weeks of life often suffer from health problems related to this deprivation. They can exhibit a failure to thrive, a condition seen in orphanages among children who did not receive enough human contact when they were babies. Newborns denied physical contact with other humans can actually die from this lack of contact, even when provided with proper nutrition and shelter. What Are the Benefits of Massage for Children?